Lance Bass was at NASA JSC for a short training period after returning from Russia, where he had been training cosmonauts with the Russian Soyuz Crew 5. While in Houston, Lance asked Susan H. Anderson of the NASA JSC Education Department to arrange an educational outreach program with Houston area music students. The students at Pearl Hall Elementary School were the “Luckiest kids in Houston” as they walked on the set for the live international web cast in the studio at Johnson Space Center. Lance answered questions from the students live during the broadcast as well as questions emailed in from people all over the world. Lance has become a member of the United States Secretary of Education Rod Paige’s Entertainment Industry Advisory Board to help the secretary with some of this special programs to benefit our nation’s children. 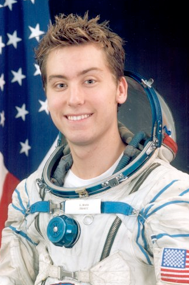 *Lance Bass is the ultimate multi-hyphenate: Singer-Dancer-Actor-Producer-Entrepreneur-Manager-Philanthropist and most recently, certified Cosmonaut. Best known as a member of the phenomenally successful pop group *NSYNC, he has also made a name for himself in a variety of other endeavors. Lance has sold some 25 million records worldwide as a member of *NSYNC. The group holds the all time record for most album sales in a single day (over 1 million). As a member of *NSYNC, Lance has won a number of awards, including People’s Choice, American Music Awards, MTV Video Awards, Kid’s Choice, and a host of Grammy nominations. For much of 2002, Lance focused on his quest to travel to space and the International Space Station. He successfully trained to be a cosmonaut at Russia’s Star City in 2002 and was certified by both the Russian Space Program and NASA for an upcoming mission aboard a Soyuz capsule. He remains active in various charitable organizations, most particularly The Lance Bass Foundation, created to meet the health and educational needs of children, *NSYNC’s “Challenge for the Children ” and Sela Ward’s “Hope Village for Children”.